Events and things to do by month January, February, March, April, May, June, July, August, September, October, November, December or follow links to cinemas, theatres, museums and historic attractions, general attractions and festivals around Queensland. In our Tours, adventure and activities section, you'll find everything from leisurely river cruises and cuddling a koala to skydiving and hot air balloon rides. Community Groups & Services includes links to community services and organisations around Queensland. Keep up with the latest news & current affairs and political and lobby groups in Queensland. 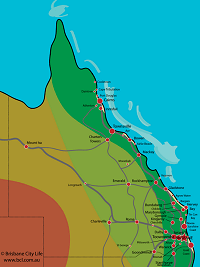 The rate of development in South-East Queensland, the state's historical reliance on coal and mining, and challenge to move to renewable energy resources and better land management bring fierce political battles in Queensland. Moreton Bay and its islands provide water sports, sailing and seaside suburbs. The Pacific Highway leads south to the Gold Coast. North is the picturesque countryside of the Glasshouse Mountains. Bribie Island offers the first surf beach to the north. The Sunshine Coast towns and hinterland are popular holiday spots. Further north of Brisbane are the Whitsunday Islands, the Great Barrier Reef, and tropical North Queensland – all popular holiday destinations. Travelling west of Brisbane, past Ipswich, you soon climb the Great Dividing Range to Toowoomba and the rich plains of the Darling Downs.